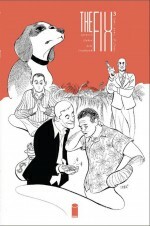 * here's Steve Lieber paying tribute to Al Hirschfeld on a cover for his The Fix series. That's super cute. * here's a bunch of covers and information on Karen Berger's new comics line, including an Anthony Bourdain comic that seems closer to the Harvey Pekar fan side of his personality than the Ramones fan side of his creative skill-set. * there's a lot going on on Amazon.com, which is a terrible place to find out exactly when comics are coming out but a pretty good place to find out in rough measure if something is coming out. The listing are up to mid-May by now, and you can tease gems out of there like the third Riad Sattouf Arab Of The Future volume out in Spring, a promised Kramers Ergot top secret surprise and a potential prestige-comic return for Rick Veitch. * finally, I'm going to focus as much as I can on my blogging this trip. I'm not sure how much publishing stuff will be announced, although certainly we'll get something from the bulk of the mainstream and sort-of mainstream publishers in attendance. I'll also ask around after projects. I think a lot of people will be looking with some curiosity towards Marvel in terms of fleshing out its Fall in-full-stride revamp, particularly moves that might enhance the experience of reading those comics.